During the Summer of 2013, NRB Construction embarked on their first Central Teaching Space contracts having been awarded both Contract 1 and Contract 2. These contracts were in 12 sections spread across 13 buildings on the main University of Leeds campus and included the internal refurbishment of 50 teaching rooms, lecture theatres and laboratories to provide upgraded facilities. The works for C.T.S. 2014 were all encompassed within one contract and involved the strip out and installation of new mechanical, electrical and audio visual services. Installation of new partition walls, movable walls, floors and ceilings and redecoration throughout. This again was completed in sections across eight buildings and involved 27 teaching spaces. Having successfully completed the previous two years within the University’s Central Teaching Space and having a proven track record on these fast track contracts, NRB Construction were again awarded both Contracts 1 and 2. This year the works involved the internal refurbishment of 36 existing University teaching rooms, lecture theatres and laboratories to provide upgraded facilities. The project was completed in 15 sections at various properties across campus within a twelve-week time-frame. The C.T.S. 2016 project had an extended contract period to allow time for three large lecture theatres to undergo a complete redesign and deliver an entirely new concept based around flexible, collaborative learning and an incorporation of much greater use of technology. 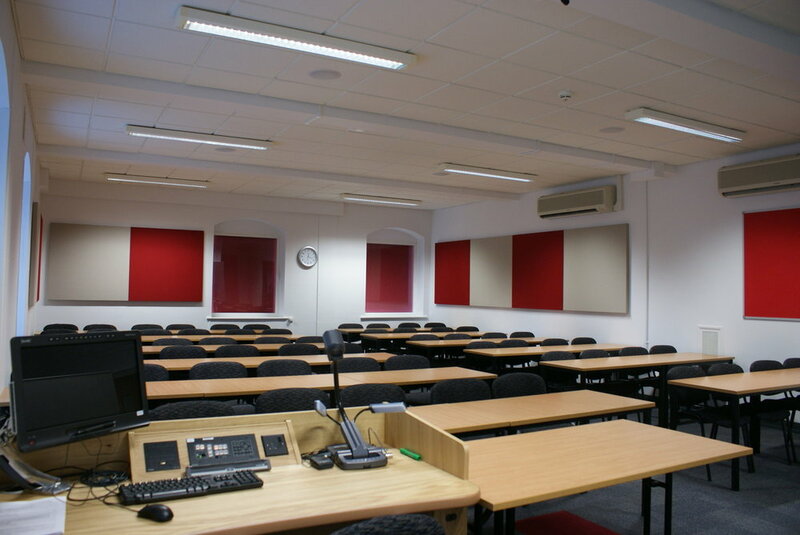 The Collaborative Lecture Theatres incorporated bespoke timber slatted suspended ceilings, booth seating and technology to promote interactivity between students with the concept of “active learning”. Again, the C.T.S. 2017 project was undertaken in a live university environment, spread across multiple buildings, some of which have listed building status. Twenty two teaching spaces were refurbished to provide upgraded facilities, with works including new mechanical, electrical and audio visual installation along with flooring, ceilings and decoration. In addition, a number of the lecture theatres underwent further improvements to ensure they were fully compatible with the Disability Discrimination Act (DDA) requirements. 2018 saw NRB Construction been awarded our sixth consecutive Central Teaching Space project and involved the refurbishment of forty seminar rooms and lecture theatres within seven buildings spread across campus. The work included new small power, data and lighting installations, suspended ceiling replacement, general joinery, redecoration, flooring, upholstery, comprehensive audio-visual and loose furniture upgrades. In addition to the refurbishment of the teaching facilities we were required to upgrade the surrounding communal spaces within three of the buildings. Again the 2018 contract was subject to phased completion and was undertaken in constrained, live environment.